Pro Air 60 Pond Aeration Kit - Aquascape, Inc. 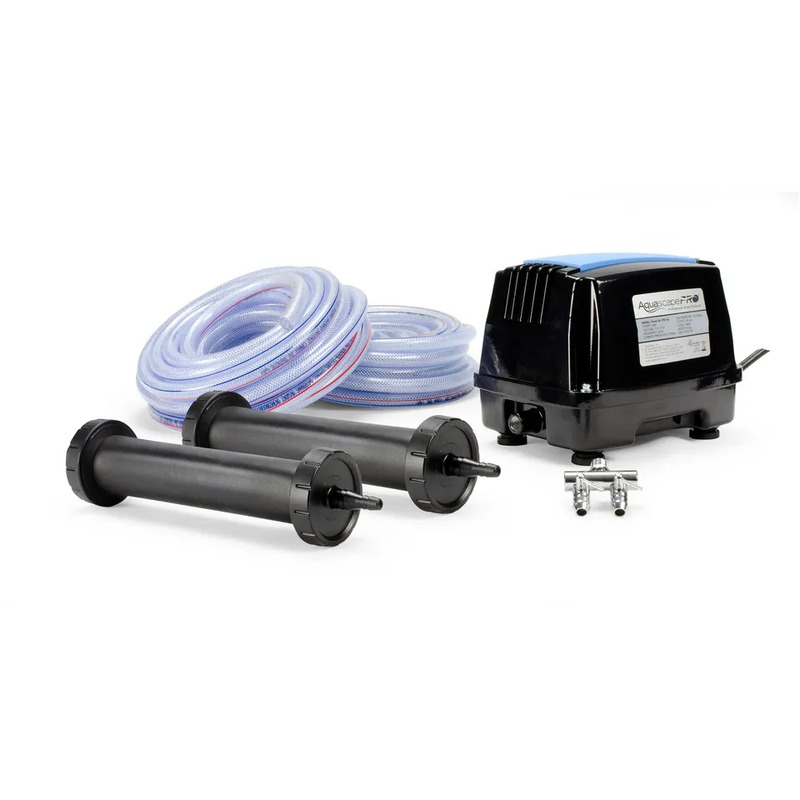 The Aquascape Pro Air 60 Pond Aeration Kit is the ideal solution for aerating ponds and water features up to 15,000 gallons. The complete kit provides everything needed to supply dissolved oxygen directly to pond water, helping all biological processes and ensuring healthier water, fish, and plants. The system can also be used during freezing months where it will keep a hole open in the surface of the pond to help keep pond fish safe through the winter. The energy-efficient, outdoor-rated, 45-Watt compressor with heavy-duty metal housing stands up to the elements, and its integrated rubber feet effectively minimize noise and vibration. Two specially-designed, maintenance-free, 10 aeration diffusers use a self-cleaning rubber membrane which expands to clear clogging dirt and debris. The diffusers interior weighted ballast keeps them at the bottom of the pond without the need for additional weights. The included 2-Way compressor manifold allows for installation of two separate airlines with the added benefit of individual airflow adjustment. The kit includes 60 of freeze-resistant 3/8 braided aeration tubing with a pre-installed check valve built to last in all seasons. Stainless steel hose clamps are included to secure aeration tubing to the manifold and diffusers. With the Pro Air 60 Pond Aeration Kit, it is easy to maintain clean, clear, and healthy water. Aquascape is passionate about the products we produce, providing unique products, designs, and features that stand above the competition.